Kompromat means they have him Compromised…as evidenced by Trump’s wimpy kowtowing to Putin. The definition of kompromat is “compromising material,” which they saw Trump as an easy target & we’ll get to more of that below. And part 3 we have commentaries & a song for Bush 41. But first as an intro, here at TheVORACS, we pledge to be your one source stop that provides important political perspectives on the relevant Trump news from the week, conveniently gathered together in one place on a single blog. My apologies our last part 1 message never got posted on Friday & finally went up yesterday. With so much news last week I was working with, I missed my deadline, submitting it to our social media manager who posts these messages after she’d already left on Friday. So if you happened to notice Part 1 was missing over the weekend, it is posted now dated Nov. 30 (with lots of fascinating info on the Cohen plea & other headlines). There have been way too many times I’ve cut the deadline too close (including today), so I’ll try to shorten the messages & number of links posted, making sure these messages get done on time to post Tuesday & Friday afternoons. As I endeavor to be more selective on the articles I choose to post, the thing that makes it so difficult is there are so many pertinent news stories that keep coming out in this Trump era, with every week & even every day being a symphony of chaos, confusion & outrageousness that should be exposed. Especially as Russiagate comes to a head & likely dramatic conclusion, the newsfeeds overload will be crazier than ever. So if the biggest political scandal in America’s history blows wide open, we’ll follow the headlines wherever they take us. Special counsel Robert Mueller’s prosecutors have told defense lawyers in recent weeks that they are “tying up loose ends” in their investigation, providing the clearest clues yet that the long-running probe into Russia’s interference in the 2016 election may be coming to its climax, potentially in the next few weeks, according to multiple sources close to the matter. The new information about the state of Mueller’s investigation comes during a pivotal week when the special counsel’s prosecutors are planning to file memos about three of their most high profile defendants — former Trump national security adviser Michael Flynn, former Trump campaign chairman Paul Manafort and former Trump personal lawyer Michael Cohen. A Flynn sentencing memo is due Tuesday, and memos about Manafort and Cohen are slated for Friday. All three documents are expected to yield significant new details on what cooperation the three of them provided to the Russia investigation. There has been much speculation that Mueller might file his memo in Manafort’s case under seal in order to prevent public disclosure of the additional crimes his office believes Manafort committed when he allegedly lied to prosecutors and broke a plea deal after agreeing to cooperate. But Peter Carr, spokesman for the special counsel, confirmed to Yahoo News on Monday that the Manafort memo “will be public,” although he added there could be some portions that are redacted or filed as a sealed addendum. The Manafort memo has been requested by the federal judge in his case so that prosecutors could, for the first time, spell out what matters they believe Manafort has lied to them about. The fact that Mueller is planning a public filing about Manafort suggests he may no longer feel the need to withhold information about his case in order to bring additional indictments against others. That would be consistent with messages his prosecutors have given defense lawyers in recent weeks indicating that they are in the endgame of their investigation. “They’ve been telling people they are tying up loose ends and trying to conclude,” said one source familiar with the communications between Mueller’s office and defense lawyers who represent key witnesses in the case. That message was reinforced to some degree Monday when Mueller’s office talked to congressional investigators as part of an ongoing discussion about whether new subpoenas for testimony by House and Senate committees might interfere with Mueller’s investigation. The response, which surprised one investigator, was that it would not, at least in matters relating to alleged obstruction by the White House in the Russia investigation itself. “What we were told is that the investigation has reached a mature enough stage that they’ve basically talked to everybody they want to talk to,” said a knowledgeable source who asked not to be identified because of the sensitivity of the matter. Mueller’s office declined any public comment when asked to confirm that account, leaving open the possibility that there still could be a few witnesses yet to be questioned. Another source indicated that Mueller’s office is still asking congressional investigators to stay away from some other witnesses. But if true, the response on Monday could also be an indication that the special counsel does not plan to press for a face-to-face interview with President Trump, who submitted written responses to Mueller’s team in mid-November on matters relating to the Russia probe. The president’s lawyer, Rudy Giuliani, did not respond to a request for comment. By all accounts, last week’s guilty plea by former Trump lawyer Michael Cohen was one of Mueller’s more significant documents. It revealed that during the 2016 presidential campaign, Cohen was in direct discussion with an assistant to Dmitri Peskov, the press secretary for Russian President Vladimir Putin, about securing financing and land for the construction of a Trump Tower in Moscow. Cohen told Mueller’s prosecutors that he briefed Trump about the plans on multiple occasions and that discussions about the Moscow skyscraper continued until June 2016 — six months after he previously had told Congress he pulled the plug on the project. Cohen is due to be sentenced in federal court in New York next week. While Mueller has not yet filed a sentencing memo in that case, Cohen’s lawyers have asked that he avoid jail entirely, and Mueller’s sentencing memo is due Friday. The president, meanwhile, offered his own suggestion — that his former lawyer should be jailed and “serve a full and complete sentence” — in a tweetstorm early Monday. The only other publicly known matter Mueller is believed to be focused on relates to former Trump adviser Roger Stone and conspiracy theorist Jerome Corsi — both of whom have been aggressively investigated to determine if they had advance communications with WikiLeaks or associates of the group about its plans for the release of stolen emails of Hillary Clinton campaign chairman John Podesta in the final weeks of the 2016 presidential election. We know with total certainty, as the Mueller cases keep revealing & we keep hearing with our own ears, the Trump campaign & administration have constantly bombarded us with a litany of lies, covering for themselves & portraying an inaccurate picture of their actions. If all of them were really innocent, why all the lying? Whether this unprecedented level of lying has crossed over into criminal activities, we must wait for the investigations to be completed to find out. At the very least, Trump campaign & White House policies were driven by the president’s personal financial interests, but the signs point towards a far more extensive quid pro quo. And the available evidence does indeed indicate kompromat with respect to what the Russians have on Trump, so it’s up to investigators to find out what that kompromat is. Do people really believe with all these business ties & Trump campaign officials in regular contact with shady Russians up through 2016, that no coordination was taking place with that same foreign country who subsequently was proven to have interfered in our presidential election? We’ve got to figure very few outside those Trumpeters being brainwashed by the Fox-led echo would actually think there was no connection. If it can be proven there was this conspiracy to steal an election, no penalty could be too harsh for a crime that might rise to the level of treason. And signs of crimes just keep coming. Trump’s statements & tweets lately about Mueller’s witnesses are a recipe for obstruction & witness tampering. Plus every time we learn of more evidence coming from the probe, the more Trump & his minions are caught in their own previous lies. It looks like we may see the facts soon as to why so many in the Trump campaign were in regular contact with Russians, & then subsequently lied about it all. The sentencing memos scheduled in different courts this week against Flynn, Cohen & Manafort could be electrifying if made public rather than keeping under seal. It might just offer evidence of crimes by many among Trump’s inner circle & perhaps Trump himself. The Cohen & Manafort filings are scheduled for Friday, while Flynn’s could be released any minute now. In addition to working with Mueller to disclose the connections the Trump campaign had with Russia, Cohen is also working with New York authorities on potential campaign finance violations from the hush money payments to Trump’s mistresses, tax fraud by the Trump family business & charities fraud by the Trump Foundation. That’s a whole lot of legal liability for the prez & as more details are made public from these various investigations, it could be the weight of multiple crimes which would bring down this presidency. Other political updates coming out are Manafort planning a trip to Ecuador in 2016 in search of Julian Assange, while Roger Stone just now plead the 5th to Congress. Additional developments around the latest Cohen plea deal look ominous for Trump, and not only because Cohen reportedly has spent a whopping 70 hours talking to investigators. In a sentencing memo filed in court late Friday, Cohen’s attorneys said he has voluntarily cooperated with the New York attorney general’s office on “state court action in which the NYAG has sued the Donald J. Trump Foundation and certain individual defendants, including Donald J. Trump. He also provided the NYAG with documents concerning a separate open inquiry.” The nature of that separate inquiry is unclear. Cohen has also cooperated “on an expedited basis” with New York tax authorities, according to his attorneys. Trump reignited talk of presidential pardons this week around Paul Manafort’s case, but that constitutional power would not be applicable if Trump or his associates were potentially charged with crimes by the state of New York. Meanwhile, reporting from the Wall Street Journal late this week included some bad news for Donald Trump Jr., whose testimony to congressional investigators has raised questions about whether the president’s eldest son and leader of the Trump Organization committed perjury. The president’s week of escalating rage about Mueller and recent news accounts of his particularly foul mood suggest that Trump grasps how Mueller is bearing down on him and his inner circle. As Garrett Graff wrote persuasively in Wired earlier in the week, Mueller’s endgame may now be coming into view. The special counsel has in effect already been publishing an iterative “Mueller report,” Graff noted, to the tune of nearly 300 pages thus far of vividly detailed court filings. There is more to come soon: By December 7, Mueller’s team is scheduled to disclose details in a sentencing document on the alleged “crimes and lies” that blew up Manafort’s own plea deal, which may point to Manafort having coordinated with the Trump White House to impede Mueller’s work. Perhaps only Mueller—and maybe President Trump himself—knows how this all ends. But from the accelerating special counsel’s investigation to the imminent swearing in of a new Democratic House majority with subpoena power, the American public will soon know more of the story. The president of the United States’ personal lawyer admitted to lying to Congress about the president’s business activities with a hostile foreign power, in order to support the president’s story. In any rational era, that would be earthshaking. Now it’s barely a blip. It’s frankly easy to become lost in this maze of Mueller news, to slide into a googley-eyed trance simply trying to parse the Manafort-Trump-Mueller-Assange-Corsi-Stone–Don Jr. –Putin-Flynn- Cohen-Sater-Ivanka–Erik Prince–Deutsche Bank Mad Libs on TV chyrons. * Even Ocean’s Twelve didn’t have this many characters. In the absence of a mile-high whiteboard or pocket Collusion flashcards, it feels hard to get your bearings. But what’s important to process this week—in addition to the fact that the president and those around him are starting to sound panicky—is that we can say with certainty that Mueller is building a slow, well-supported, public case for wrongdoing that was covered up with public lying and lies told under oath. It’s still unclear if any of these acts will prove criminal, and it is unclear what happens if they do. But that’s what’s happening. It is worth recognizing that at the same rate that Bob Mueller is amassing a mountain of provable factual evidence, the president is continuing to construct his national political movement based on the principle that reality should mostly be a choose-your-own-ending kind of enterprise. His response to the Cohen news was predictable—hoax, witch hunt, he just “lightly looked at doing a building somewhere in Russia,” all very cool and very legal. But as Democrats take control of key committees in Congress in a few weeks, it will prove harder and harder to claim that the witness testimony, and facts, and evidence that the public will see with their own eyes is actually a grand-scale “Deep State” conspiracy. That is all about to happen, and as this week’s deluge demonstrated, it is likely to happen at a pace that will be challenging for many of us to keep up with. There is no doubting that for millions of Americans, nothing Robert Mueller ever reveals will ever dislodge anything. But even without the delicious caper-movie master-plan reveal scene, it is becoming clear that Mueller’s investigators have been and are building to something that cannot be easily discounted. You can decide for yourself if all this is the beginning of the end or the end of the beginning or merely the middle of forever. For anyone who still allows the facts to determine outcomes, even through the confusion and the hectic pace, this was the week it got real. The key revelation of Michael Cohen’s new guilty plea is this: Justice Department Special Counsel Robert Mueller is one step closer to showing links between Donald Trump’s business interests in Russia and his conduct as a candidate for president. The criminal information filed by Mueller’s prosecutors in the Southern District of New York states that in a period that lasted until the middle of June 2016, Cohen asked the press secretary to Russian President Vladimir Putin for a meeting with Putin in Russia as part of a deal that would have led to a Trump Tower being built in Moscow. And according to the document, Cohen spoke to Trump about the deal more than three times during that period, and asked both Trump and other senior campaign officials about a Trump trip to Russia in connection with the deal. Cohen is pleading guilty to lying to Congress by saying these negotiations had ended by January 2016 and by denying that he spoke to Trump about them. The details that emerge in the document are fascinating and rich. But the main takeaway is that Cohen and others in the Trump organization were actively doing a Russia deal that linked Trump’s emerging presidential candidacy with his business interest in a Moscow Trump Tower. And Trump knew about it, to a degree yet to be revealed. Andy Wright, a law professor and founding editor of the Just Security blog, called it a “bombshell” week. “In an investigation full of blockbuster surprises, this week the tempo and the gravity of what’s been happening outstrips anything we’ve seen so far,” he said. “At least rivals it, when we’re talking about the week that Manafort got indicted. “Presumably there are going to be some more indictments in short order.” Trump appeared to be feeling the heat. As he left Washington on Thursday for the G20 summit in Argentina, the president yelled denials over the roar of helicopter rotors. He then abruptly canceled meetings with Russian president Vladimir Putin and other world leaders. Before dawn on Friday, Trump tweeted that he had “lightly looked at doing a building somewhere in Russia” during the campaign but it was all “very legal & very cool”. Congress may yet have the opportunity to judge whether Trump’s Russia ties were wholly legal. In a couple of years, voters might have the opportunity to register a verdict on whether they were cool. But it’s also raised new questions which have yet to be answered. The investigation led by the former FBI director has already resulted in more than 100 criminal counts against 33 people and three companies, according to a count by the New York Times. These include 12 Russian intelligence officers; Donald Trump’s former campaign chair, Paul Manafort; Manafort’s aide, Rick Gates; Trump’s former national security adviser, Michael Flynn; and a foreign policy campaign adviser, George Papadopoulos. Here are some of the unanswered questions the Mueller investigation has raised so far. How did Donald Trump respond to the Mueller team’s questions? What contacts did WikiLeaks have with Trump confidants? What will happen to the confidential report Mueller is supposed to file? It’s been axiomatic from the start of the Russia investigation that it is different from Watergate in one important way: the crimes that Nixon committed behind closed doors in the White House secretly, Trump is committing out in the open. Repeatedly lying to the American public? Every time Trump tweets or opens his mouth. Obstruction of justice? Firing Comey. Firing Sessions. Calling Mueller’s investigation a “witch hunt” and calling for its end. Tampering with witnesses? Dangling pardons. Engaging in a cover-up of a crime? As he lives and breathes. But there is one thing Donald Trump and his people have sought to keep secret from the earliest days of his campaign right up to the present moment: their connections with Russians. If, in the past, we thought we knew about most of the Russian contacts, events this week have taught us that we were wrong. First there were new revelations about Roger Stone and Jerome Corsi serving as cut-outs between the Trump campaign and WikiLeaks. The Guardian even reported that Stone had met with Julian Assange in the Ecuadorian embassy in London. Then it was announced that the cooperation agreement between Special Counsel Robert Mueller and former Trump campaign manager Paul Manafort had blown up. Incredibly, it was revealed that Manafort’s lawyers have maintained an open channel of communication with Trump’s legal team, presumably informing them of the focus of Mueller’s investigation and everything the FBI and prosecutors from Mueller’s team had asked Manafort. Mueller filed a document telling the same court that had signed off on Manafort’s plea bargain that he had lied to the FBI and withheld information in violation of his cooperation agreement with prosecutors. In other words, Michael Cohen told the Congress of the United States the same lies that Donald Trump had told the American people during his campaign and after he became president of the United States, when he said repeatedly that he had no deals in Russia, that he had nothing to do with Russia, and that he knew of no contacts between his campaign and Russians. Over the last 18 months, we have discovered that during Trump’s campaign for the presidency and afterwards, members of his campaign and others close to him like his son and son-in-law were meeting over and over again with Russians. There were the contacts between his campaign advisers George Papadopoulos and Carter Page with Russians. There were the multiple meetings between his top foreign policy adviser Jeff Sessions and Russian Ambassador Sergey Kislyak. There was the meeting in Trump Tower between Donald Trump Jr., Jared Kushner, and Paul Manafort with six Russians who had told the Trump campaign they had information that would “incriminate” Hillary Clinton. There were meetings between Trump advisers and Kislyak at the Republican National Convention and on the sidelines of a major foreign policy speech Trump delivered at the Mayflower Hotel. There were repeated contacts between Trump’s campaign adviser Michael Flynn and Sergey Kislyak. There were meetings in Trump tower between Flynn, Kushner, Bannon and others and Kislyak and Sergey Gorkov, the chairman of Vnesheconombank, a major state-owned bank in Russia with close connections to Vladimir Putin. There was the meeting in the Seychelles Islands between Trump adviser Erik Prince and Kirill Dmitriev, a Russian banker with close connections to Vladimir Putin, attempting to establish a “back channel” between Trump and Putin. The contacts between Donald Trump’s campaign were so many, they were hard to keep up with. And this week we learned that Trump’s people had been even busier with Russians than we had thought. The criminal information filed in court on Thursday in connection with Cohen’s guilty plea is stuffed with connections that we haven’t known about between Trump’s people and Russians. Cohen was in contact in January of 2016 about Trump’s Russia project with the office of Dmitry Peskov, described as a “senior aide to Putin.” (Peskov is in Argentina at the G-20 summit right now with Putin, serving as his press secretary) Cohen stayed in contact with people in Russia through Felix Sater, identified as “Individual 2” in the criminal information. Sater is a felon and former FBI informant who worked with Trump on the Trump Soho Hotel project. Cohen discussed in May of 2016 the possibility of traveling to St. Petersburg, Russia to meet with either Putin or the Russian prime minister. He discussed arranging for Trump to travel to Russia to meet with Putin about the Trump Moscow project after the Republican National Convention. The discussions about travel to Russia continued into June, with messages between Cohen and Sater on June 9 through June 14. Throughout the entire time, according to the criminal information, Cohen spoke about the Moscow deal with Trump multiple times and kept his children informed about his activities. You will recall that others in Trump Tower were busy with Russians in June. On June 3, Donald Trump Jr. received an email offering to set up a meeting with several Russians who had incriminating information about Clinton. The meeting took place on June 9. On June 14, Michael Cohen met Felix Sater in the lobby of Trump Tower and told him that he would no be traveling to Russia, marking the end of Trump’s Russia project, according to the criminal information filed Thursday. Upstairs at Trump Tower on that same day, Paul Manafort was being promoted to chairman of the Trump campaign for president. The dates of the Russia connected events in the Trump campaign are interesting for one very important reason. On May 26, CNN announced that having won the Indiana primary on May 3 and won the remaining May primaries running uncontested, Trump had passed the threshold of 1,237 delegates necessary to guarantee his nomination as the Republican candidate for president. So when the Russians offered dirt on Hillary Clinton to the Trump campaign in June, and when they were in contact with Felix Sater trying to set up meetings between Michael Cohen and Putin before the convention, and with Trump after the convention, they knew they were dealing with the man who would be running for president of the United States as the Republican nominee. That’s why Trump’s Moscow tower project was canceled on June 14. It was done mutually by Trump and Putin, because neither man wanted to run the risk of damaging Trump’s chances to be elected president in November. Putin had already begun helping Trump’s election chances. On June 12, the Washington Post reported that the Democratic National Committee email servers had been hacked. We didn’t know then who had hacked the Democratic Party emails, but we know now who did it. On July 13, Robert Mueller indicted 12 Russian military intelligence officials for hacking the Democrat’s emails. U.S. intelligence agencies previously announced that the hacks were done on the orders of Vladimir Putin. On June 15, the day after Manafort’s elevation to campaign chairman and the closure of the Moscow Trump tower deal, an online figure calling himself “Guccifer 2.0” released the first Democratic Party emails. We now know that “Guccifer 2.0” was a Russian intelligence officer. Throughout his campaign, Trump had been praising Putin. On June 3, Trump had told a campaign rally, “Putin said Donald Trump is a genius and [the] next great leader of the United States.” On July 27, Trump held a press conference and announced, “Russia, if you’re listening, I hope you’re able to find the 30,000 emails that are missing. I think you will probably be rewarded mightily by our press.” All this stuff was kept secret. All the meetings between Trump’s people and Russians. All the contacts between Michael Cohen and Russians about the Trump Moscow tower. All the knowledge they had in advance of the leaks of Hillary Clinton’s and John Podesta’s emails. They kept secrets for the same reason Nixon kept secrets: because they were guilty of crimes. Michael Cohen and Michael Flynn and Paul Manafort and others have plead guilty to their crimes. This week we learned that Mueller’s team is circling Trump Tower like sharks around the carcass of a dead whale. They even flew north to take Cohen’s guilty plea in a New York City courtroom. Do you want to know how to tell Trump realizes how much trouble he is in? On Thursday, as they climbed the stairs to Air Force One at Joint Base Andrews outside Washington D.C., and as they descended the stairs from Air Force One in Argentina, Donald and Melania Trump held hands. It was the first time the president and his wife had touched each other in months. They are massaging the family image, but it’s too little and too late. There is speculation in Washington that Trump’s family is in Mueller’s cross hairs next. Congressman Adam Schiff, who will take over chairmanship of the House Intelligence Committee on January 3, has said that it will be among the committee’s first business to release the testimony of Donald Trump Jr. and Jared Kushner to Mueller’s investigators, something Devin Nunes and the Republicans have refused to do. Also on Thursday, 170 police officers and German federal prosecutors raided the headquarters of Deutsche Bank AG in Frankfurt, Germany as part of an investigation into whether the bank helped criminals launder money. Last year, the bank paid a $425 million fine in the United States for helping Russian banks launder $10 billion. Deutsche Bank is the only major lender that has been willing to lend to the Trump Organization over the last decade. Trump’s latest financial disclosure forms revealed in May that he owes the bank as much as $175 million, according to MarketWatch. Special Counsel Mueller issued subpoenas to Deutsche Bank for information regarding Trump’s loans last December, according to The New York Times. With Donald Trump, it’s always about the money. He is not going to sit in the White House and watch his business empire suffer the same fate as Paul Manafort, who forfeited $46 million to the government as part of his plea deal. He’ll resign with an assurance that he is pardoned for his crimes in the Russia investigation, the same way Nixon resigned with a pardon for his crimes in Watergate. So Russiagate isn’t that different from Watergate after all. They will have the same end game. and he is sure acting like someone who is in giant trouble. 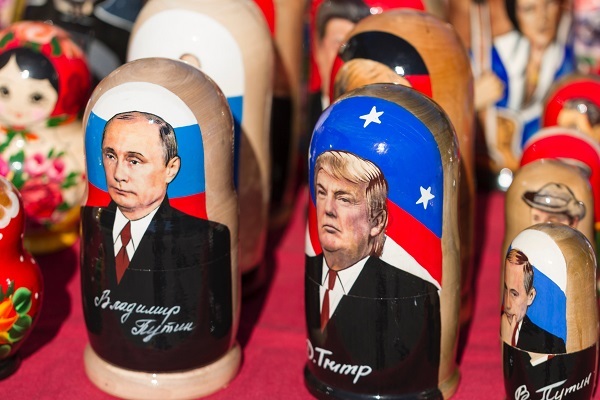 The idea that a US president is in any way doing the Kremlin’s business as well as his own is the stuff of spy thrillers and of John le Carré TV adaptations. Yet the icy fact is that the conspiracy theory may now also contain an element of truth. On Thursday, Mr Trump’s longtime lawyer, Michael Cohen, pleaded guilty – in a court filing by the special counsel Robert Mueller – to lying to the US congress about Mr Trump’s Russian interests and connections during the months when the New York property magnate was running for the Republican presidential nomination in 2016. It was not true, Mr Cohen has now admitted, that the Trump organisation ended its interest in Russian deals in January 2016; not true that there were no plans for Russian visits by Mr Trump later in 2016 to make property deals; not true that the Russian government did not respond to the deal overtures. Indeed, as late as May 2016, Mr Cohen was in indirect contact with Mr Putin’s office about the possibility of a meeting with Mr Trump in St Petersburg in June. Days before he took office in 2017, Mr Trump said that “the closest I came to Russia” was in selling a Florida property to a Russian oligarch in 2008. If Mr Cohen’s statement is true, Mr Trump was telling his country a lie. What is more, the Russians knew it. Potentially, that raises issues of US national security. If Mr Putin knew that Mr Trump was concealing information about his Russian business interests, this could give Moscow leverage over the US leader. Mr Trump might feel constrained to praise Mr Putin or to avoid conflicts with Russia over policy. All this may indeed be very far-fetched. Yet Russia’s activities in the 2016 election against Hillary Clinton and in favour of Mr Trump are not fiction. They prompted the setting up of the Mueller inquiry into links between the Russian government and the Trump campaign. Another document this week suggests a longtime Trump adviser, Roger Stone, may have sought information about WikiLeaks plans to release hacked Democratic party emails in 2016. There is nothing in the documents released this week that proves that Mr Trump conspired with Russian efforts to win him the presidency. Yet those efforts were real. For two years, Mr Trump has gone to unprecedented lengths to attack the special counsel. After November’s midterms, he seemed on the verge of firing Mr Mueller. He may yet do so. But this week’s charges suggest that there is plenty more still to be revealed. Mr Trump still has questions to answer from the investigating authorities, from the new Congress – and from America’s long-suffering allies. Cohen initially expected a pardon from Trump for being loyal, but ultimately flipped when Trump distanced himself. But if it can be proven Trump secretly communicated wink-wink-nod-nod assurances there would be pardons to those witnesses who towed his party line, that would indeed represent the crimes of witness tampering & obstruction: michael-cohen-thought-trump-would-give-him-a-pardon-report & also trump-roger-stone-tweet-witness-tampering-experts. These include the Twitter comments where Trump praises his brave comrades like Manafort & Stone for not blowing the whistle. Cohen told the House and Senate intelligence committees last year that he only briefed Trump three times about the plan to build a 100-story skyscraper in Russia’s capital. Cohen also said his general inquiry to the Kremlin went unanswered. But Mueller’s office said Cohen, a former Trump Organization executive, briefed Trump repeatedly about the project and had a 20-minute phone call in January 2016 with a Kremlin official’s assistant in which Cohen asked the Russian government for help securing financing and land for Trump’s tower. Cohen’s lawyers added Friday that Trump was briefed by Cohen on this extraordinary request of the Kremlin while Trump was running for president. Cohen told Congress the Moscow project was dead by January 2016, when in fact it was still alive—including discussions about Trump and Cohen traveling to Russia for it—until June 2016. Cohen’s lawyers said this misleading testimony was prepared last summer while Cohen “remained in close and regular contact with White House-based staff and legal counsel” to Trump. The cover story was crafted when Cohen “specifically knew” that Trump and his spokespersons sought to portray the Moscow project was “effectively terminated” before the Iowa caucuses in Feb. 2016. “At the time, Michael justified his false summary of the matter on the ground that the Moscow project ultimately did not go forward,” the lawyers wrote. Among the numerous comparisons, another aspect to Russiagate that channels Watergate & led to Nixon’s resignation, was lying to the American people about info that was actually central to the cover up of a crime: trump-told-americans-to-read-gop-house-report-he-knew-had-lies-in-it-nixon-was-impeached-for-the-same-thing. Also among the many legal perils Trump faces, another one could be violating the FCPA: trump-presidency-threatened-50-million-penthouse-gift-putin. I would say offering the Russian dictator a $50 million penthouse suite in Trump Tower during the presidential campaign could certainly be construed as a bribe. I’ve warned about the threat of an EMP attack many times in the past, & it’s an issue we should continue warning about until we finally take steps to build up our defenses against it: northkorea-russia-emp. In the next link are two of the world’s most brutal dictators known for murdering political opponents, yucking it up at the G-20 summit: putin-saudi-crown-prince-shake-hands-g20-summit. Since Trump envies their dictatorial power, I seriously believe he secretly desires to lead with that same unabridged authority. Which is fine for those who want to live under fascism.